Poll: What style do you prefer? Poll: Should owls be tamable? Thanks for reading! I'd like to see what people of think of this quick image based presentation, I tried to remove all the unneeded detail and get right to the point. Do you prefer this format, or my old style? Great idea. They shouldn't use the owl for night vision potions because you know the saying right. Carrots improve your eyesight. The propelled arrow would be very cool. Mostly Support! This is a fun idea! Also clever that they spawn that night--especially with Mob B coming up, hunting for owls could be interesting! This is a really good idea. Owls would provide life to the game, a way to know if there's a mob nearby (very useful when you think you completely lit up the area but you didn't), and a new kind of arrow that is useful. 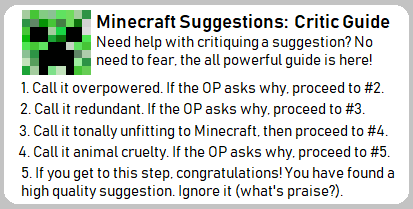 Normally I would be opposed to such a mob having a useful drop, as it might encourage players to go on an owl killing spree, but in this case the drop is used for arrows that you might only need in certain circumstances, so players would only rarely kill owls. The arrows would be very useful if in the Ender Dragon fight or Wither fight, and could also prove to be valuable if trying to kill the Monster of the Night Skies. What if owls could make nests inside of trees (like this)? That could be interesting, but I think it might get too complicated. The way I imagine this happening is owls would "carve" out a block on a tree trunk and then go into that empty space for a short period of time. But there would only be one way out of the nest, so a player could easily kill an owl as it tries to escape but just standing in front of the hole. Besides that, owls would have a bad vantage point to see other mobs. It would be hard for them to fly around because they'd always be moving upward (something I tried to avoid by making owls slowly glide for the most part, because I don't see owls moving and turning fast like bats or parrots). Lastly, when an owl flies away from the nest, would the nest block disappear? Otherwise a single owl could grief five trees in one night. 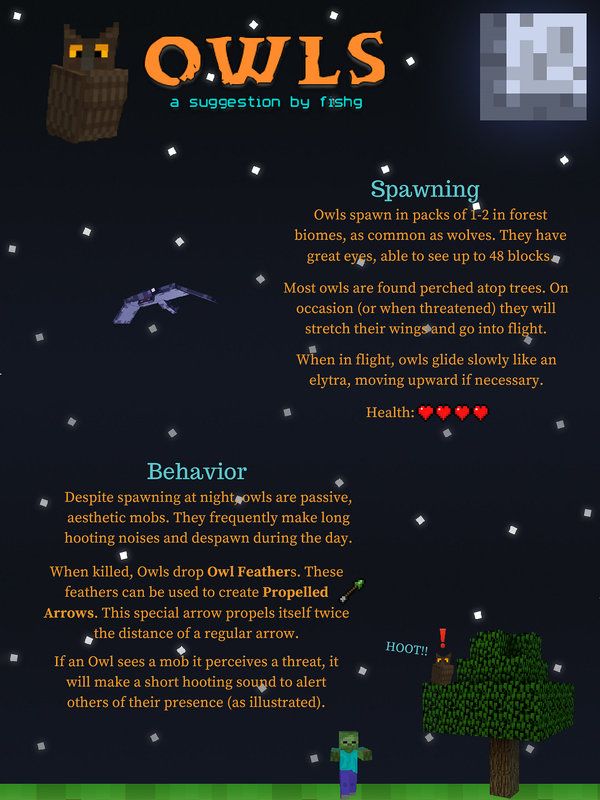 Add that owls despawn during the day, so every night a new set of owls spawn in and create a new set of nests. By a Minecraft week nearly every tree in the forest would have nest, with some even having more than one. It's a neat idea at first glance, but when you start think about how it would be added it just doesn't work. Owl nests would be cool for realism sake, but unfortunately it'd be too damaging to the gameplay. I edited the post so that owl feathers don't brew night vison potions. This seems like a good solid idea. I have full support. As for the poll, I think you should provide a lot of detail, but if it gets too long, split it into different threads. This seems like a good idea, and definitely not OP. Good idea, time something airborne & friendly was added…. Really cute! And useful as a sentry of sorts if you make your base in a forest. But would it be as useful if they just spawn and despawn randomly like any other passive mob? Are they tamable? Anyways, I am all for this idea! I didn't want to make owls tamable because then they could be seen as a ripoff to parrots, and I didn't want the idea to get too complicated. The monster of the night skies is only supposed to come if a player hasn't slept for a while (i think) so having owls hunt them doesn't make much sense (plus I think the monster would win in a battle). But I suppose tamed owls could chickens or rabbits and return the food to the player. Does anyone else think owls should be tamable? If enough people want it I can add it to the suggestion, but for now I think I'll keep it as it is. Well parrots aren't really functional, they're just unique in that they are flying pets that an sit on your shoulders. Owls can warn you of approaching mobs, but I don't know what the ideal item to tame them with would be... maybe rabbit meat or something. They would also naturally target rabbits in the wild.